Webcampak constantly records its background activities and store those in files available from the desktop interface. Those can be accessed by clicking on "Webcampak > Logs"
This simple feature runs 3 background commands to identify devices connected to Webcampak, a refresh button on the top-right corner let users manually trigger a refresh (for example after plugging a device). Webcampak record a very large portion of its background activities. Working on the assumption that logs are useful to debug an issue but less useful when there is no issue, we enabled log rotation, to prevent the local hard drive from being overloaded by unused logs. The system will break down log files in 500 KB chunks and will only keep 10 of those files, which should give you about a week worth of logs for source capture. 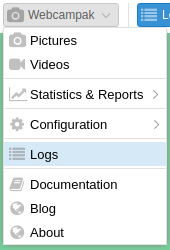 Logs files are the best way to understand activities being performed by the system and potentially understand what is causing issues. 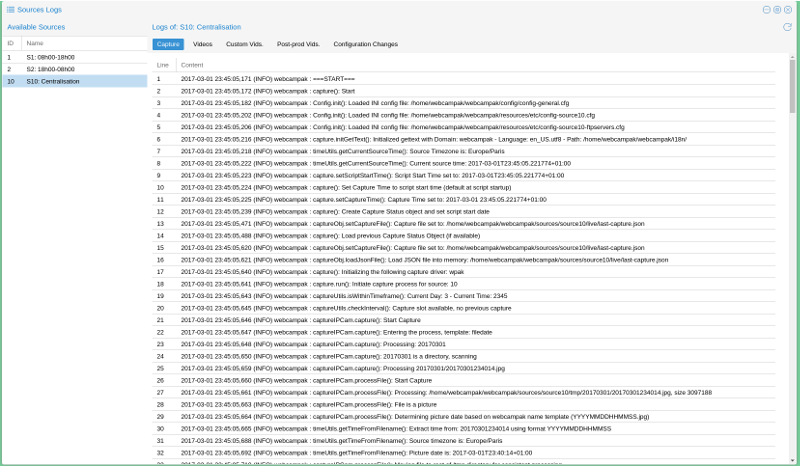 We always recommend our users, involved in Webcampak configuration, to understand what logs are and how to access & read them. A Sample log file taken from one of our systems is available for reference, we'll progressively go through it. Before triggering a capture, Webcampak first activity will be to get ready for this capture, load config parameters, setup the timezone, prepare the capture file. Next, Webcampak will verify if it is allowed to capture (capture calendar, time since the last capture). If all is correct, it will initiate the actual capture process. Just before capturing the picture, it will record the time. by comparing the current time with the beginning of the capture process, we can see that it took Webcampak a bit more than 2 seconds to get there. Then the system actually captures the picture, transfer the file locally and check its file size. It might be interesting to focus here on the actually time between the camera was requested to capture and the time the picture was actually stored on local disk. In this particular example, it took just short of 6 seconds. This number will vary a lot depending on exposure time, USB speed and file size. Webcampak will then apply all the configured manipulation to the picture. You can notice that some of the manipulations are being timed, to provide additional insights into which of the manipulations take time. Finally, it captures the time again, and compare it with the beginning of the script. In this particular case, the entire capture process took a bit over 20 seconds. We usually recommend our users not to configure Webcampak to capture at a rate higher than the longest capture time over a configured time interval. 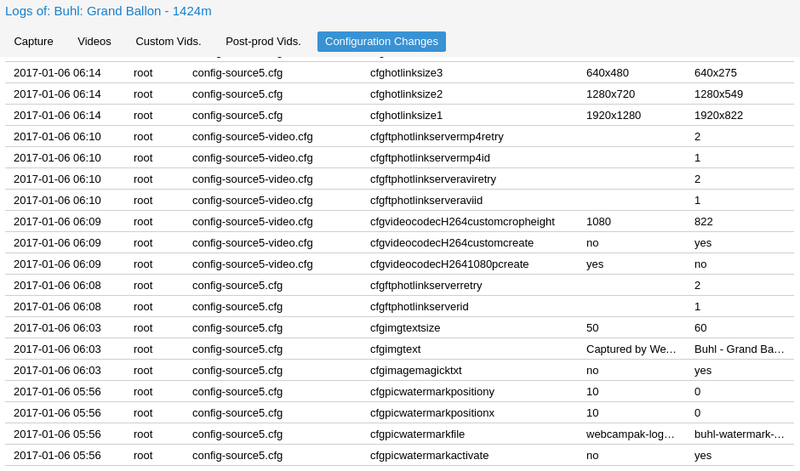 Webcampak also records configuration changes (who changed what when). Due to the fairly low change frequency, those logs are not size-limited and will record indefinitely.